This months challenge was deceptive in its simplicity I think. I did fine it very simple and easy to do, but the effectiveness of the nut butter and the totally unique element that it added to what would otherwise have been a very simple pasta dish was extraordinary. I would never have thought up the idea of making a nut butter myself. 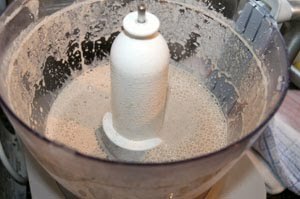 I am a huge fan of peanut butter and the delicious satay sauce I have made with it, so why it has never occurred to me to make a nut butter myself and think up some applications – I don’t know. I can’t say that I am the world’s most creative cook so that is probably why I can take someone else’s recipe and put my own twist on it and make it uniquely mine, but to think up something from scratch is sadly beyond my talents I think. This is why I am grateful for the Daring Cooks and Bakers. It inspires me in completely unique ways, allows me the opportunity to step outside of my comfort zone, and try something different with the moral support and inspiration of all the other Daring Cooks. I have to admit that I was not sold on the idea of mushrooms and pecan nuts but it is a gorgeous combination and one that I will certainly be trying again. Cook pasta according to package instructions in salted water. Drain, rinse, and keep warm. Cut chicken into even strips/cubes as desired. Sprinkle with a bit of salt and pepper to taste. Heat 1 teaspoon (5 ml) olive oil a large nonstick skillet over medium-high heat. 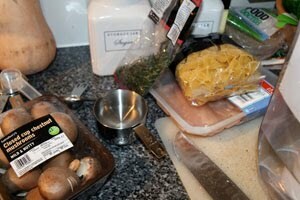 Add half the chicken; sauté 3 to 5 minutes on each side or until cooked through. Cook the chicken in 2 batches, adding more oil if needed for second batch. Set aside cooked chicken on a clean plate, cover to keep warm. Add deglazing liquid to pan if using and stir up any browned bits. 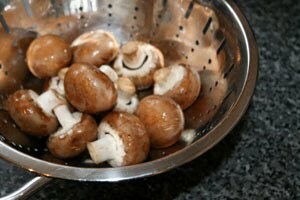 If needed, add another teaspoon (5 ml) of oil (or more) to pan for sautéing the shallots and mushrooms. 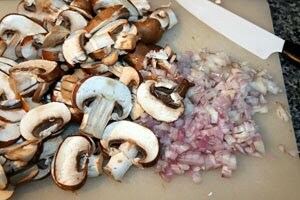 Sauté the shallots and mushrooms over medium heat for 4 to 6 minutes or until mushrooms are tender and starting to brown. Add fresh thyme to the pan. Stir in pecan cream; bring to a boil. Reduce heat and simmer for about 1 1/2 minutes till reduced slightly. 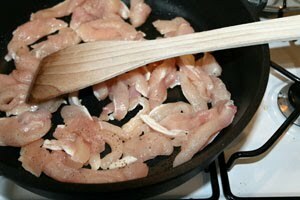 Slice chicken into thin strips. Divide the noodles among serving plates. 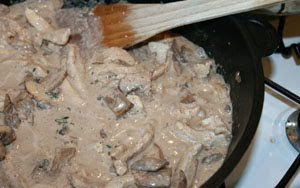 Add a scoop of the mushroom pecan sauce on top of noodles. Lay sliced chicken on top. 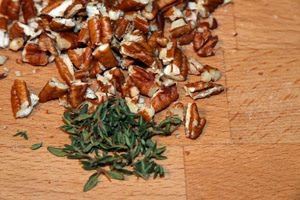 Garnish with fresh thyme and/or a pinch of chopped pecans if desired. 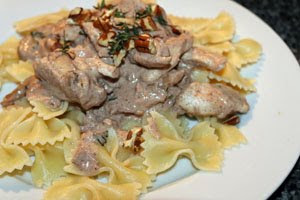 Your pecan & mushroom sauce looks wonderful on the bowtie pasta! I feel the same way about the Daring Cooks inspiring me to cook outside of my comfort zone. Well done. WOW it is so good to hear that the Daring Kitchen inspires you so much and help you focus your creative juices so much and don't worry it is very very hard to come up with a new recipe from scratch I think a typical cook only may came up with a new recipe once or twice in a lifetime. When have you hear of a totally new recipe most recipes are variations on a theme. Lovely work on this challenge. Cheers from Audax in Sydney Australia.